This is a peanut butter-chocolate lovers heaven! The cookie bars are cooked to perfection and this frosting recipe is INCREDIBLE! In a large mixing bowl, cream butter and peanut butter together. Add both sugars and beat again. Add eggs and vanilla. Add flour, soda and salt and mix until combined. Press dough onto a cookie sheet and bake for 15 to 17 minutes or until bars are golden brown. In a small microwavable add chocolate chips and 1/4 of the whipping cream. Melt in 30 second incriminates, stirring between each increment, until chocolate is smooth. In a separate bowl, beat butter, slowly add melted chocolate mixture and continue beating. Add vanilla, powdered sugar, cocoa, salt. Beat on low. Slowly add the rest of the whipping cream and beat until smooth. 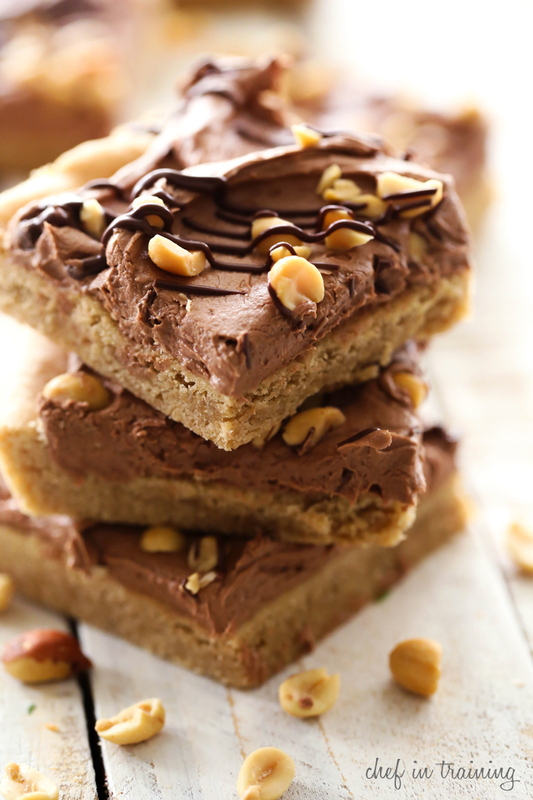 Spread over cooled peanut butter bars and garnish with peanuts.